What belongs together comes together. IWC Schaffhausen is treating its chronograph movement to a ceramic case made of zirconium oxide. Entirely in the spirit of its namesake Leonardo da Vinci, the Da Vinci Chronograph Ceramic embodies innovation and first-class engineering in perfected form. The world owes a great deal to Leonardo da Vinci. The universal genius from Tuscany created incomparably beautiful works of art, investigated and documented natural laws, and designed buildings and machines which were often far ahead of their time. Innumerable sketches also provide evidence of his enthusiasm for watchmaking. Many of his pioneering discoveries in the area of helical and bevel gears and complicated screw transmissions are to this day component parts of many machines – including watches. Fascinated and inspired by the spirit of Leonardo, the watchmakers of IWC Schaffhausen have given the name Da Vinci to particularly innovative models at regular intervals in the past. The Da Vinci model from1985, for example, made watchmaking history. At a stage when quartz already appeared to have superseded mechanics in the measurement of time, the Schaffhausen company focused its attention on the beauty and strength of mechanics and built a mechanical chronograph with a perpetual calendar, which played a part in the renaissance of the mechanical watch. The design of the complicated mechanism and its user-friendly operation can be summarized as being ingenious in their simplicity. Only one year later, in 1986, IWC Schaffhausen provided further proof of its love of innovation by building the first watch with a case made from the extremely hard, scratch-resistant and impact-resistant ceramic, zirconium oxide. This milestone of case engineering also bore the name Da Vinci. In the year 2007, when IWC Schaffhausen presented its newly developed flyback chronograph movement, this appropriately made its debut in the completely redesigned Da Vinci family. 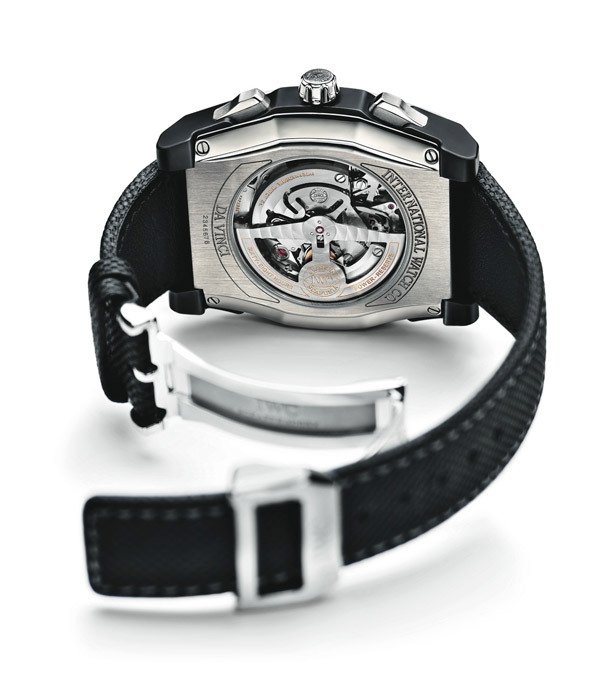 The IWC-manufactured movement is conspicuous with a number of design features that are unique. Particularly noteworthy is the display of the recorded time, which has bid farewell to all its classic predecessors in the interests of improved user-friendliness. The recorded hours and minutes can now be read on a counter in the 12 o’clock position like a second time display. The 89360 calibre also stands out with a new double-pawl winding system and a flyback function: actuation of the lower button during a timing function causes the recorded time to return to zero and restart immediately, but without stopping the stopwatch mechanism. Such an extraordinary movement also merits anextraordinary case, in addition to a see-through sapphire-glass back; after all, the Da Vinci family is still inspired to this day by the special ability of Leonardo to think and act innovatively and imaginatively both technically and creatively. The tonneau-shaped design, which draws its strength from the interaction between edges and curves, between convex and concave forms, has now been translated into an exceptional material combination of ceramic and titanium in the new Da Vinci Chronograph Ceramic. 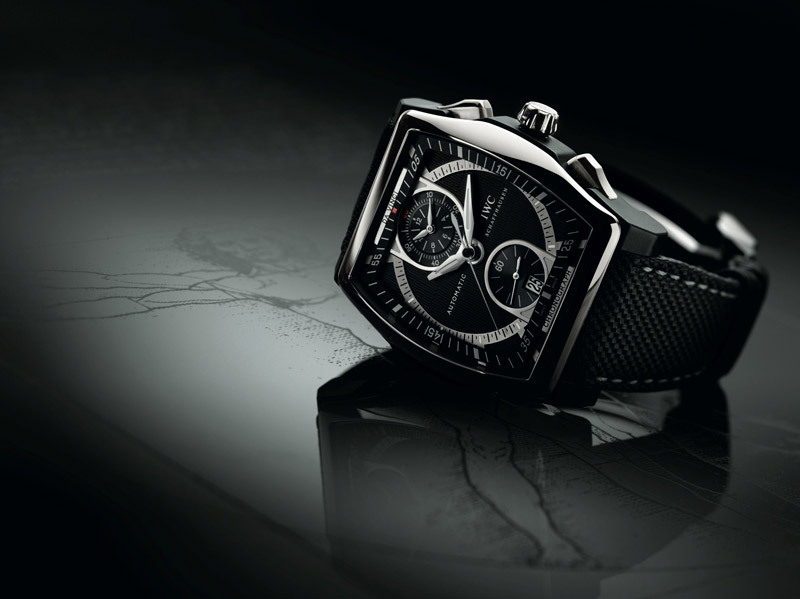 The central section of the ceramic case of the new Da Vinci Chronograph Ceramic consists of zirconium oxide, which was first used in a watch case in 1986 – in a Da Vinci. This model was produced in only very small numbers because of the enormous difficulty in machining the hard material. Over the years, however, the technicians and engineers have acquired a lot of experience in the manufacture and machining of this extremely scratch-resistant, non-magnetic and acid-proof ceramic. The case blanks can now be formed more efficiently and with greater accuracy than before from the mixture of zirconium oxide powder and a binder. They are sintered at temperatures between 1500 and 2000 degrees Celsius followed by cooling in a complicated process to enable the material to attain all of its outstanding properties. Diamond tools are required for the intricate finishing of the blanks. At this point, the specialists at IWC possess such thorough mastery of this technology that the new Da Vinci Chronograph Ceramic will be available in unlimited numbers as a model in the collection. What is more, the case stands out with a technical highlight that is admired by experts. It is manufactured with such precision that the movement can be fitted directly into the ceramic case – without a movement security ring. The bezel, back, buttons and crown provide a colour contrast in the form of ultra-hard titanium grade 5, which, unlike the titanium alloys formerly used by IWC, can be polished and satin-finished. These two materials, titanium and ceramic, are not only extraordinarily robust and scratch-resistant, but they also have an extremely pleasant, silk-like feel. The special three-dimensional design of the dial with a réhaut volant – a tonneau-shaped minute display, which appears to float above the dial – adds to the attractiveness of the latest Da Vinci model. This flying chapter ring, a first for IWC, arcs in parallel with the sapphire glass and in so doing visually reduces the height of the inside of the bezel. The overall appearance is rounded off by a high-quality calfskin strap, to which a special finishing technique imparts a surface structure resembling that of a high-tech woven fabric. With the new Da Vinci Chronograph Ceramic, IWC Schaffhausen has achieved an impressive combination of high-tech and elegance.